A good rule of thumb for newbies is to avoid trying to grow more than ten different kinds of vegetables in that first year. Most important, pick up to ten vegetables that the whole family enjoys. If you are the only one liking radishes, maybe that can be saved until next year. Some vegetables (peas and beans) are usually planted directly in the garden. Other common vegetables (cabbage, broccoli, squash, peppers, and tomatoes) can be started indoors using seeds or can be planted directly in the garden using seedlings purchased at the garden center. For the first year, we strongly recommend you avoid trying to grow your own seedlings indoors. If you insist, we have a very detailed step by step section on starting seeds indoors- in spring. We all need a digital soil thermometer. In early spring I carry my soil thermometer every time I go out in the garden. No seeds and no seedlings should go into the soil before the soil temp is 40 degrees or higher. You measure down about two inches. 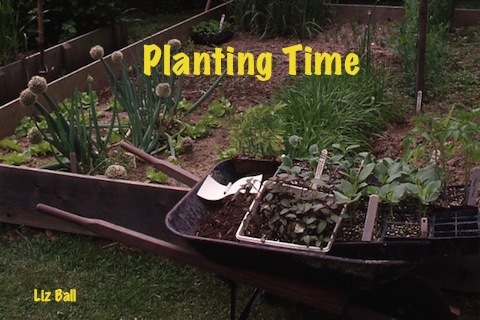 When the soil hits 40 then you can plant seeds for peas, spinach, Swiss chard, beets, and leaf lettuce. You must wait maybe three or four weeks until the soil temp hits 60 before putting out any cold weather seedlings like cabbage, broccoli, and cauliflower. Wait a few more weeks to plant seed for green beans and cucumbers when the temp is 65, not any earlier. The big mistake is made when putting the warm weather seedlings into the garden. Tomatoes, sweet peppers, and summer squash should definitely not go out into the soil until it hits 70 degrees. If you really like tomatoes, you wait until it hits 75 degrees; that five degrees makes a difference. I predict our soil temps do not hit 70 much before the second week in June. I may be preventing stress in my plants by waiting long enough to get to the right temperature reading, but who is taking care of my stress that is building every day I have to wait? Baseball season can’t come too soon. In nature that has not been screwed up by humans there is naturally a group of root fungi called mycorrhizae (my-cor-i-zy) that have been determined to be essential to the healthy growth of plants. Virtually all plants on the planet, not living in soil messed up by humans have a colony of mycorrhizae helping them be healthy. We can now add mycorrhize to the planting hole for all plants we put into our garden. We all should do that every time we plant a vegatable seedling. The product we are recommending is a liquid called Thrive. Any beginning vegetable gardener will usually have major problems figuring out how to label the varieties of each vegetable he or she planted. We have all had our careful labels disappear in the first rain. We all have lost the label when the crop is harvested. Here is our recommendation for yardeners who still have not figured out the labeling problem. Go with plastic labels that are white; you can see them in the soil next spring. Always use a waterproof magic marker and don't worry about putting vegetable name on the label. All you want to keep track of is the variety. So put the variety up front and dark on the white label. After we have tried for many years, we have learned never to assume you can keep track of this year's varieties next year; that has to be recorded on paper or in the computer. THE WHOLE REASON FOR HAVING A LABEL IS TO BE ABLE TO REMEMBER WHAT WORKED AND WHAT DID NOT. If you don't care, forget labels.